Applying a traditional oil base wood stain with a white bristle brush. Applying oil base stain is slightly different than applying water base stain. Oil based stain comes in two popular varieties: gel and liquid. Both produce similar results but there are slightly varied techniques on applying each type. Gel stain is much thicker than liquid stain. Gel stain has higher pigment content and therefore can produce intense colors. Gel stain requires more wiping during the application process. Oil stain can be finished with a top coat. Oil stain is simpler to apply and wipe off. While you can mix two different shades of oil base stain to create a custom color, you should never mix an oil base stain with a water base stain. After applying the stain, allow several hours for the wood to completely dry. Keep stained wood out of direct sunlight to avoid fading. Top coat with a clear wood finish for added protection. When it is time to clean after applying stain, use mineral spirits. Before starting the staining process, the piece of wood furniture that will be stained must be prepped. First, take off the furniture’s drawer pulls, hardware, and removable decorative pieces. Second, pull out all of the furniture’s drawers and remove all of the furniture’s doors. Third, repair all of the furniture’s damage by filling holes, dents and scratches with wood putty or wood filler. Fourth, sand the furniture using varying grades of grit sandpaper – starting with a medium grit paper and transitioning to a fine grit paper as the sanding process progresses. Fifth, clean the wood furniture using a tack cloth. Also vacuum the wood so that all sawdust and other debris are completely removed. Before beginning the staining process, make sure your work area is prepared. First, clean the area and make sure all dust and debris have been cleared. You don’t want saw dust to land on the wood during the staining process. Next, cover the area you will be using with drop cloths and old newspapers. It can be difficult to remove oil based wood stain that has spilled or splashed on floors, work tables or walls. Therefore, make sure everything is completely covered and protected. Finally, put on clothing that you do not care about because you are likely to get stain on your clothes and your body while you are working and you do not want to ruin clothes that you care about! 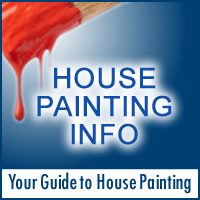 You can use one of three materials to apply gel stain: a clean cloth, a paint brush, or a paint pad. Divide your project into sections (e.g. drawers, top of furniture, front, legs, etc…). Using your chosen applicator, apply a good amount of the stain to the section of the wood that you want to work on first. Make sure to use an ample amount. Once the stain has been applied, use a clean cloth to wipe it off. Using a clean cloth, rub the surface of the wood until the stain appears to be uniform in color. Alternately gel stain can be applied with a brush, pad for large flat areas, and not wiped off. This will produce the darkest colors. When applying with a brush always work from an unstained are into a stained area and blend the two stains. This will take practice, have a clean cloth available to wipe off the stain and start over if the look isn’t what you expected. After the first coat dries, add additional coats until the desired color has been achieved. Adding more coats will result in a darker final color. When the final coat has been added, use a clean cloth to polish the stain in the direction of the wood’s grain. A clear top coat should be added as a finish – although gel stain does not necessarily require the addition of a finishing layer this will add further protection. Before applying liquid oil base stain, make sure to mix the container of stain thoroughly. Make sure to follow the mixing instruction on the side of the container and continue vigorously mixing for a few minutes. Next, divide the wood into sections. 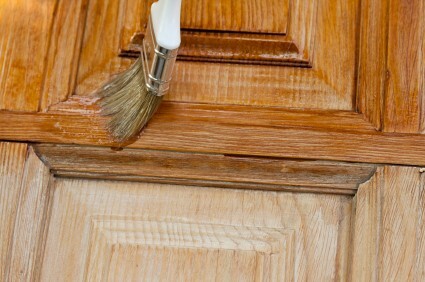 Using a paint pad, a clean cloth or a foam paint brush, apply the stain to the wood furniture. Allow to soak into the wood for a few minutes and using a clean cloth, wipe the stain off of the wood – making sure to wipe in the direction of the grain. Allow the stain to dry for a full day. If the color does not appear dark enough, additional layers can be applied. Make sure that you do not buff the surface of the wood in between layers of stain! After the last layer of stain has been applied, a top coat must be added. It is recommended that you buff the clear finish between coats to produce the smoothest surface possible. Blotching: Some types of woods are more susceptible to blotching than others. Stain often blotches on the following types of wood: cherry, pine, birch, and maple. The reasons that there are often issues with these types of woods are due to sap pockets that are not easily visible and also because of irregular wood grains. These two situations cause the stain to be absorbed unevenly which leads to a blotchy appearance. In order to avoid blotching, you can apply a wood conditioner to the surface of the wood before applying stain or you can pre-seal the surface. The only negative associated with pre-sealing and conditioning the wood is that the wood will not absorb as much stain, and the result will be a lighter color than what you might want. Uneven Staining: The best way to avoid uneven staining is to apply an ample amount of stain onto the piece of furniture and then wipe it off before it has a chance to dry. Use a clean cloth to wipe the stain, and don’t apply a second coat of stain until the first coat has a chance to dry completely. It is easier to achieve a uniform color using oil based wood stain because it does not dry as quickly as water based stain and is therefore easier to apply and wipe off without the risk of it drying too fast. Over-Soaking the Wood: There are two ways to avoid over-soaking the wood with oil base wood stains. First, you can sand the wood prior to adding the stain. This causes the amount of stain that the wood will absorb to be reduced. Second, you can pre-seal or condition the wood before adding stain. This will prevent the wood from absorbing too much stain. Over-soaking the wood with stain will result in a darker color than you may want. This is why it is important to control the amount of stain that the wood will absorb prior to applying it.